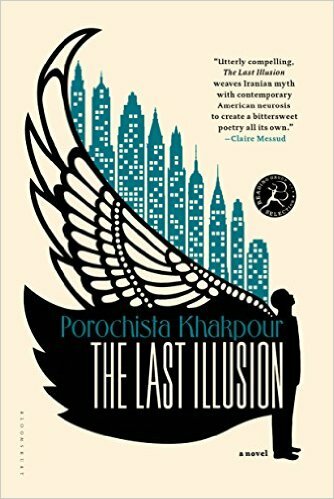 Porochista Khakpour moved to an apartment with large picture windows in downtown Manhattan shortly before September 11, 2001, giving her a painfully perfect view of the terrorist attacks. It’s no surprise that the assault on the Twin Towers features prominently in her writing. Through non-fiction essays and two novels, the Iranian-born writer has tried to understand the tragedy’s impact on her, the nation, and the world. But while her essays are rooted in facts, her fiction takes flight. In The Last Illusion there are, in fact, multiple references to flight. The main character, an albino man named Zal, is raised by his abusive mother in a cage among a balcony full of birds. Although he cannot fly, he yearns to. Rescued by an American and brought to New York in the years before 9/11, he tries to unlearn his feral ways and finds himself drawn to visionaries–an artist who claims to see the future and a famous magician who aspires, in a feat of illusionist virtuosity, to make the then still-standing World Trade Center disappear. The character of Zal is based on a Persian myth and Khakpour infuses the story with fabulous twists and turns. “It took over two and half years to sell this book whereas my first book only took a few months…. If I’d done a purely realistic take from say a Middle Eastern woman’s perspective, my guess is it would have sold faster but this idea that I was using a fabulous mode, a sort of speculative mode, and addressing this sensitive world event and then add to the fact that here I am, you know, a brown person addressing this–that caused I think some complications. Khakpour’s magician in The Last Illusion was inspired by the real life example of David Copperfield, who made the Statue of Liberty “disappear” in a television special in the 1970s. Here’s a clip on YouTube.